The following are the stories of children and adults who received cochlear implants. Learn more about the CI process and outcomes from them. Throughout my life, my parents have always told me to never let my disability define me. As a deaf person who hears and speaks well with cochlear implants and attends mainstream schools, I will not lie and say that it has been easy or that my disability does not get in my way. There have been many occasions when I just wanted to give up because I felt tired. However, I must keep moving forward because I need to realize that people with disabilities are the strongest because they encounter far more challenges than anyone else. Currently, I am attending Wheaton College in Norton, Massachusetts and have less than two months until graduation. At school, I receive accommodations such as CART, usage of an FM system, and a note-taker. When I initially entered college, I was set on majoring in chemistry with the intention of teaching high school chemistry. However, in my third year, I had to take a sociology course as a requirement. During the first office hour with my sociology professor, I told her, “I will hate sociology.” As I became more exposed to the sociology field, I discovered many different topics of interest, such as accessibility and disability. A semester later, I returned to that same professor’s office begging her to let me change my major to sociology, despite only taking one class. In my senior year, all sociology majors have the privilege of taking on an independent research project on a topic of interest. At my college, I was heavily involved in accessibility and disability issues. Additionally, I am co-founder and president of WheAccess, the first club on campus for students with disabilities. There are numerous studies on the experiences of students with disabilities within the classroom but limited on the faculty experience with accessibility. Therefore, I chose to focus my research project on understanding how accessibility shapes the faculty experience within the classroom. It is essential that we are understand the faculty perspective because it will allow us to solve many issues with accessibility in the college classroom. Advocating for accessibility and persons with disabilities has allowed me to use my voice to stand up for those who do not have a voice. As an organization, the American Cochlear Implant Alliance focuses on advocating for cochlear implants and the importance of early intervention. About thirty years ago, my parents took the risk of getting my older sister, Rachel, a cochlear implant through the early pediatric clinical trials in the 1980s. Several years later, I received my cochlear implant at fifteen months and became the youngest child in the country at the time to receive a cochlear implant. Through my parents’ continuous advocacy and support for cochlear implants and listening and spoken language, I am forever grateful for the person I am today. 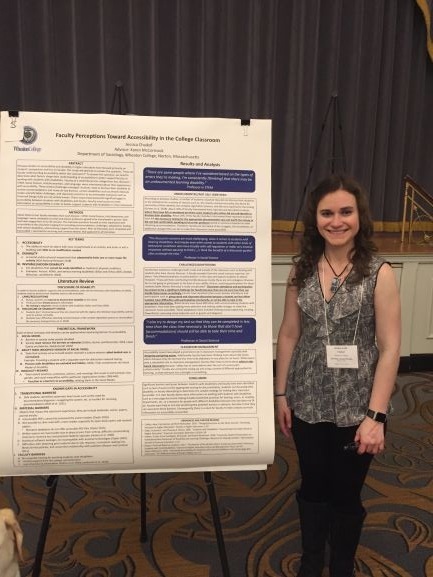 Jessica Chaikof presented a poster on her research at the Eastern Sociological Society’s winter conference 2019. She won best undergraduate poster in her session. Jake Noyd knows his cochlear implants give him super power—the power to hear! The six-year-old kindergartner is “on fire” thanks to the support of his family and an intensive early education program. Identified with a profound hearing loss at birth, Jake's family wasted no time in pursuing cochlear implants and enrolling in a spoken language education program. Early identification and intervention for kids with hearing loss can make a huge impact in helping a child reach their full speech, language and social development potential. That is why we were excited to see what happens when the early intervention process is carried out the way it should be as it did with Neil Maes, an eleven year old boy with cochlear implants who competed in the Scripps National Bee in May 2016. Please view the portrait to read about the Maes family’s hearing journey and the importance of early intervention. Their story is a wonderful example of how early intervention and detection leads to success. Neil Maes, featured above in our early intervention success story, keeps amazing us with his spelling skills. After competing in the Scripps National Spelling Bee for the second time, Neil spoke to us about what it takes to reach the national level and his goal to return one more time. Ashley Jackson is a college student drawing on her own experience of being deaf and blind to pursue a degree in Family and Consumer Science. Cochlear implants are helping her reach her academic goals and plan a future helping families that have children with special needs. Tonia McDonald, a Job Readiness Training Coordinator with the South Carolina Vocational Rehabilitation Department, attributes her personal success story to receiving cochlear implants as a young adult. The improved hearing provided by her CI's allowed her to pursue higher education and a career in public service. Chad Ruffin MD, otolaryngologist at Indiana University Cochlear Implant Program at IU Health, discusses his trials and triumphs in becoming a surgeon using cochlear implants.